Bananas are a strange fruit. Unless you grow your own, in your backyard, your bananas are picked green and hard. They ripen over time, slowly. You can speed their ripening if you store them near apples. Apples give off ethylene as they ripen, which speeds the ripening of bananas, as well as other fruit. Around here, over a thousand miles from any banana trees, bananas arrive in the store a chartreuse colour and in most cases that how we have to buy them, inedible as is. They must be ripened at home. On a rare occasion I may find one or two bananas that have reached that magical colour of brown flecked, golden yellow that signals perfection. More often than not, I’m stuck with hard, green fruit. When I find a brown bag of “over ripe” perfection in the supermarket, it is usually discounted and I love that. Imagine, perfectly sweet bananas and discounted prices, too. 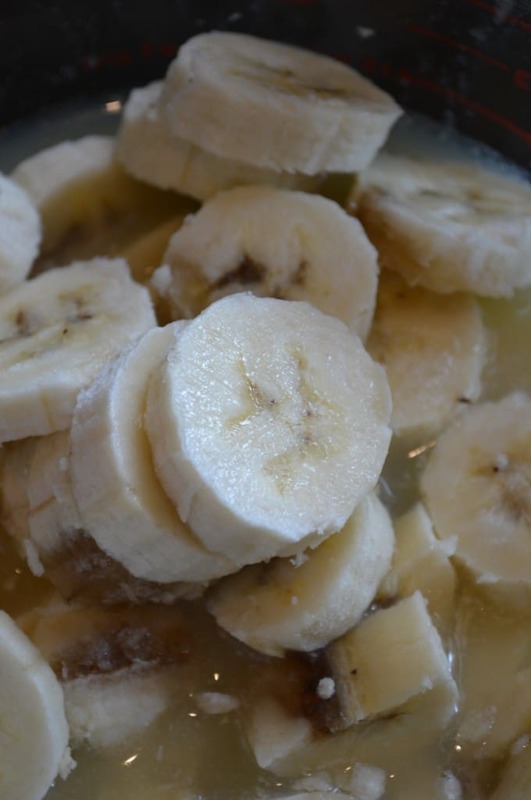 Take advantage of the discounts on ripe bananas. 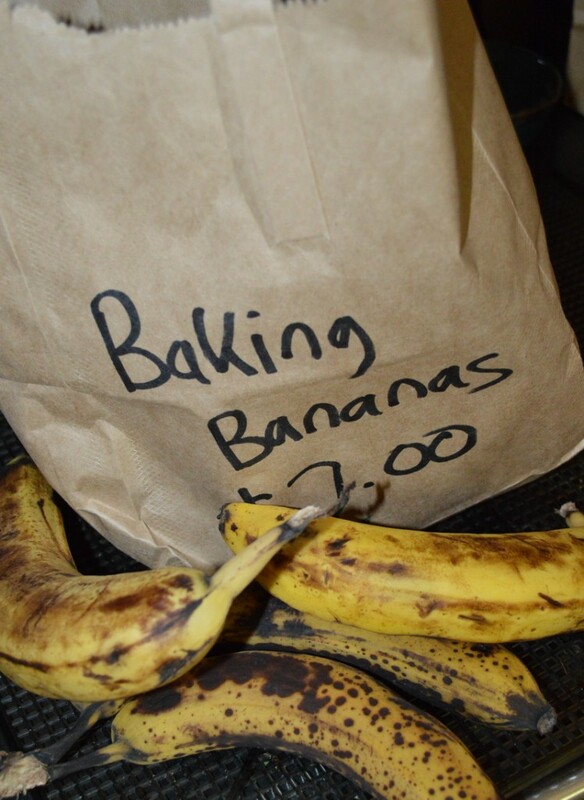 Recently I found so many discounted brown bags of perfectly ripe bananas that I couldn’t resist. I brought home 4 – 5lb bags. I sliced them, and dried them in my dehydrator. And now I have sliced, dried bananas for winter. 20 lbs of bananas, dehydrated, fit in 4 quart jars, in case you wanted to know. Dried bananas are not the same as banana chips that you buy in the snack food section. Banana chips are deep fried bananas. 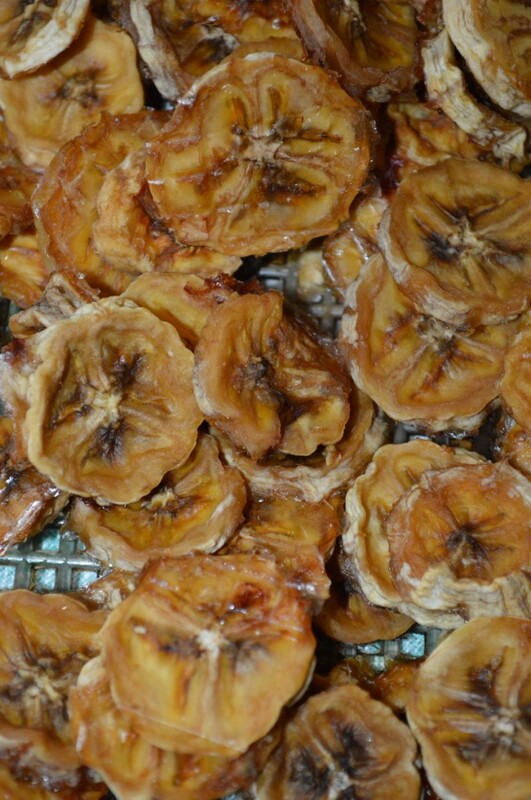 Dried bananas, on the other hand, are dehydrated fruit, with no additional oil or sugar. They are somewhat pliable when dried, rather than crunchy. They are a healthy and nutritious snack. 3. Dip the slices in lemon juice. Drain. 4. Place on dehydrator trays in a single layer. 5. Dry in the dehydrator for half the time called for in your manufacturers owner’s manual. 6. Turn the banana slices. 7. Dry for the remaining time, until fully dry. 8. Allow to cool and place in jars with a tight fitting lid. Not cool to the touch. Firm with no soft, mushy areas in the centre of the slice. If you don’t yet have a dehydrator or you are ready to upgrade, check out my tips on choosing a dehydrator. Eat sparingly, these are very sugary, calorically dense and very more-ish – easy to pile on the pounds, esp in winter lol. Useful for snowy winter hikes but not for mindless munching. Baking maybe? 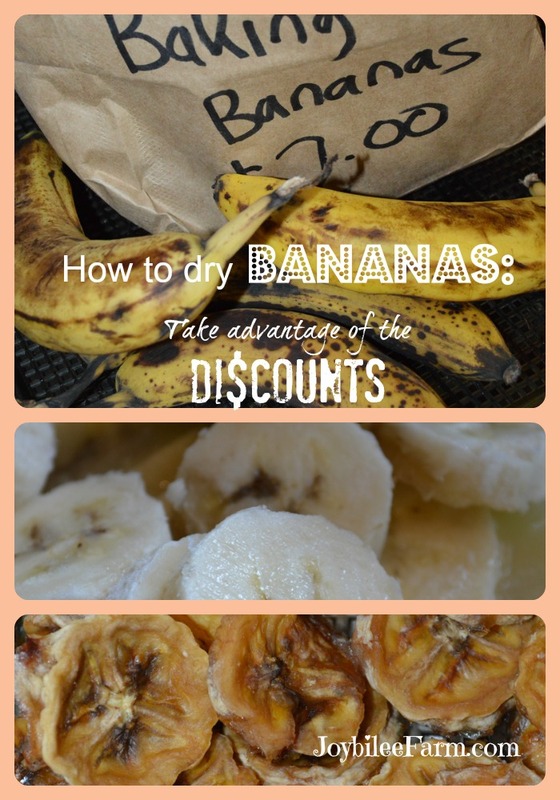 What do you DO with dried bananas? The only time I tried it they came out semi-chewy and bitter and I had to throw them out because no-one would eat them. I didn’t use lemon juice, but I can’t see that would make a huge taste difference. What are they SUPPOSED to taste like? I like them. They are super sweet and taste richly like bananas. But if they aren’t ripe they would taste bitter. Or if they are over ripe and mushy I think they would taste bitter, too. They are also very strong smelling so store them in glass jars, rather than zip loc bags or their fragrance will permeate everything that they are stored near.